12′ 15′ 19′ Pendant Cord Set is individually inspected for quality and for safety. E26 lamp holder. The Pendant Cord Set has an on/off switch and a standard polarized plug for US and Canadian electric systems. Comes with hanging hardware. 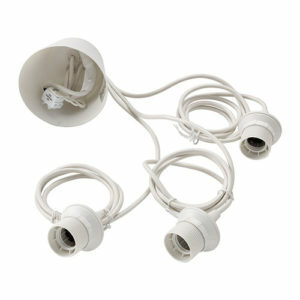 Our Pendant Cord Set will work with most paper lanterns and nylon lanterns. Many customers use our lantern cord kits for infinity lights. The Pendant Cord Set is made with a hard black plastic. The bulb requirement is a maximum of 60W. Light up your life with this twelve foot, Pendant Cord Set. Sturdy, versatile and UL certified, this hanging light will not only safely illuminate dark, hard to reach areas, but it’s sure to serve as a long-term, creative solution for your more challenging interior illumination needs. Its twelve foot, serpentine chord can be wrapped around desk or chair legs, thrown over rafters or fed beneath carpets for focused and adjustable light throw as well as discreet and convenient installation. Featuring a conveniently placed on/off switch, twenty one inches from plug, this space saving, hanging light is perfect for your home, office, workshop or college dorm.